At the start of this year, Facebook revealed that it was developing a work-focused version of its social networking tools to try and convert its consumer success into a new stream of revenue from businesses. 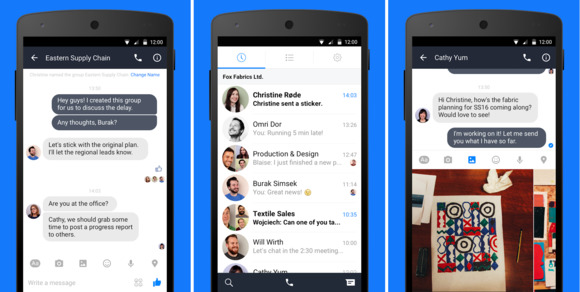 On Friday, the company continued that push by quietly launching its new Work Chat app for Android, which lets users message workmates using an interface that's almost identical to Facebook Messenger. Users can send messages to individuals or groups of co-workers, and include cute stickers to punctuate their point. Work Chat also lets users place voice calls to colleagues in their network. As with Messenger, those calls use Wi-Fi or a cellular data connection rather than the telephone network, but it should connect coworkers without requiring them to use a shared telephone directory or make international calls. The app is available for download on the Google Play Store, but people can only log into it if they have a Facebook at Work account. The only way to have one of those is to work for a company that Facebook has allowed into the private testing of its new enterprise-focused tools. According to an article from TechCrunch, 300 companies are testing the enterprise social network, and the company plans to launch it officially by the beginning of next year. Facebook at Work will be a major entry by the social networking company into the crowded space of business collaboration. It's going head-to-head with established players like Microsoft's Yammer and upstarts like Slack. It remains to be seen whether Facebook's consumer success will translate into love from enterprise users, since that road has been a tough one for its contemporaries. Dropbox may be an illustrative example. While it has massive adoption among consumers, the company has struggled to find significant traction among large businesses.